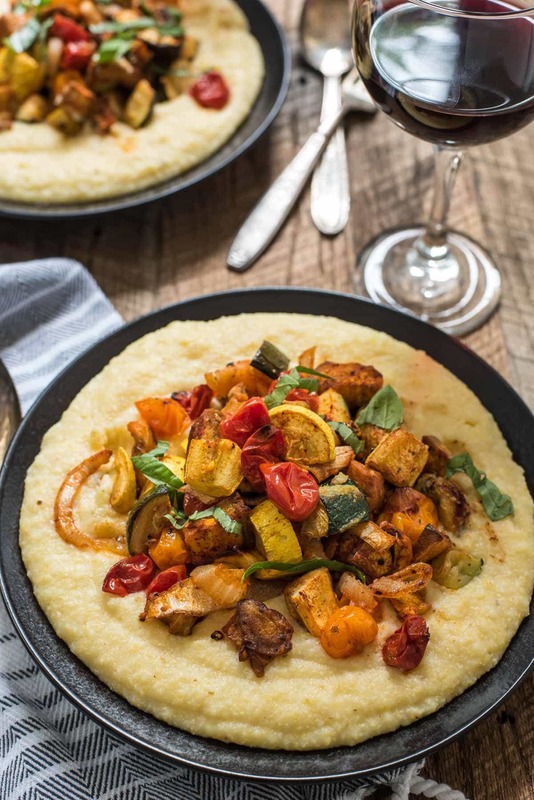 These Roasted Vegetable Polenta Bowls were developed in partnership with Kroger. As always, all thoughts and opinions are my own. I consider myself a decent planner when it comes to our weekly menus. I typically take some time on Sunday afternoons to map out our meals for the week and make a grocery list. I usually take little P with me for a grocery run on Monday mornings, and I usually enjoy this tradition. Little P is always delighted by the colorful produce and packaging, and he makes it a point to flirt with every deli counter worker and cashier we encounter. Still, no matter how much I plan, or how meticulous my list, I seem to ALWAYS forget something. It’s usually something I assume we already have, but don’t take the time to double check: the bag of flour I finished up last week, the tub of sour cream that’s developed unbecoming green spots, or the olive oil bottle with barely a drizzle left inside. Or maybe I haven’t read the recipes thoroughly, and there’s one ingredient I missed. Or maybe it’s been a rough day, and gosh I could just really go for a frozen pizza tonight. Enter ClickList, a new service provided by Kroger stores which allows you to shop online and pick up at the store or curbside. Friends, I can’t even tell you what a revelation this is. Now, when I’ve forgotten something, I can simply go online, pick out what I need and set a time for pick up. Or when I’m sick, or it’s negative nine degrees outside, or the baby is losing his mind, I can order my groceries and pick them up without ever leaving the car. Even better, I can even have my husband pick it up after work! And, bonus, I don’t have to send him my list and try to explain where to find the gruyere cheese or which exact brand of olive oil I’m after. The online ordering system is easy to use, allowing you to search for what you want by name, scroll through sales, or view by department. They’ll even keep track of your most commonly purchased items so you can add them quickly and easily next time. I decided to give the service a try a few weeks ago and ordered everything I needed for the week, including the fixings for this lovely Roasted Vegetable Polenta Bowl. The pick up for my items was ridiculously easy. You just pull up by the signs and a kind person comes and drops bags of groceries in your back seat. You pay right there, and off you go. It’s like magic. Like the grocery fairies came and dropped everything you needed right in your lap. And, best of all, the produce was all in good shape, the meats I ordered were kept cold, and everything I ordered was accounted for. Now, about these bowls. 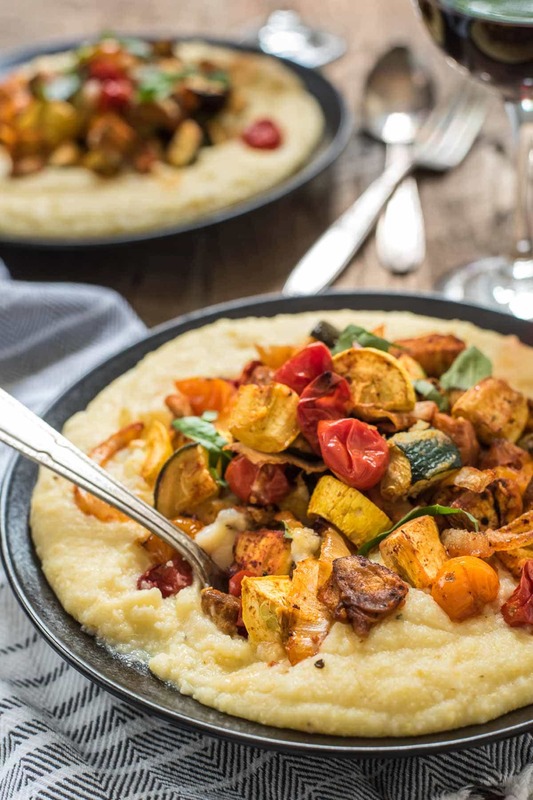 They are the perfect mash up of seasons, full of fresh summer produce made rich with roasting and then piled high on a bed of warm, comforting polenta. This is food you want to eat on the cusp of fall, when summer produce is still bountiful and full of flavor, but you’re craving something a little more cozy than salad. Smoked paprika is a staple in my cabinet, and it lends wonderful subtle heat and depth to the vegetables. My other must have? Sharp cheddar swirled into the polenta. 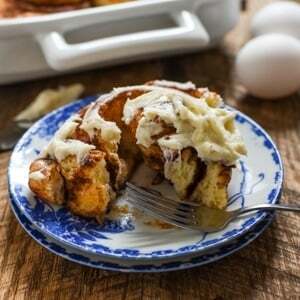 It is creamy, cheesy comfort food at its best. I will definitely be enjoying these polenta bowls all fall long, and you can bet when the weather gets cold I’ll be enjoying the ClickList service on the regular as well. I hope you’ll give them both a try! Preheat the oven to 425 degrees. 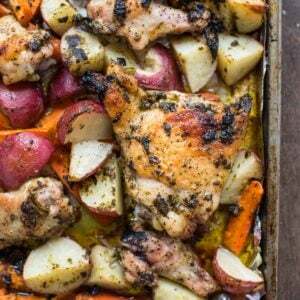 Spread the vegetables out on two foil-lined baking sheets. Drizzle with olive oil, then toss with the smoked paprika, salt, and pepper. Bake for 10 minutes then stir, rotate the pans, and bake an additional 8-10 minutes or until vegetables are tender with a browned crust. Bring the water and salt to a boil in a large pot. Pour the cornmeal into the pot in a steady stream, whisking constantly. Reduce the heat to low and continue to whisk until mixture is thick enough that the polenta grains don't drift to the bottom if you stop whisking. Cover the pot and continue to cook, whisking every 5-10 minutes. Cook for about 30-40 minutes total, or until polenta is thick and creamy. Stir in cheese during the last five minutes, whisking until melted. If we had Kroger here, I’d be using that service all the time and sending my husband to pick up the groceries! 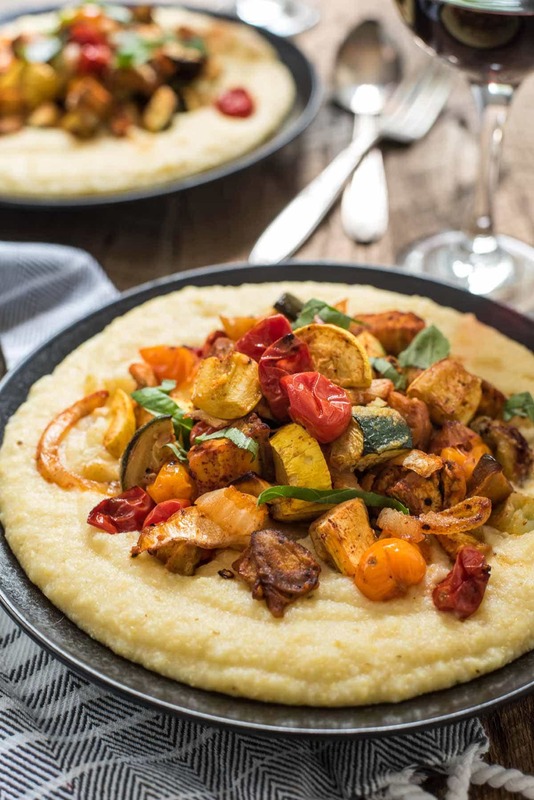 I loveee polenta and this looks so delicious, both healthy and super satisfying! That’s SO me–I always forget the one thing for which I ran to the store in the first place! Great solution, Courtney 😉 and these bowls–the perfect answer to the start of fall! YUM! You have convinced me to try Click List this week. Along with the link to clicklist, I wish Kroger would offer the option of clicklisting recipes. All ingredients added then I can scan my kitchen and delete what I don’t need. Looking forward to trying polenta and roasted veggies. That would be a great idea and very convenient. I hope you enjoy the polenta and that Clicklist works out well for you! It should serve between 3 and 4 people depending on how hearty their appetites are! This recipe has cheese in the ingredient list; however, no mention of cheese in the instructions. Is this melted into the polenta as the picture does not show cheese as topping? Yes, I’m sure one could make either way, yet clarification would be helpful. Thanks! So sorry about that! I melt the cheese into the polenta. I’ll add that to the recipe as well. So sorry about that! I’ve fixed the recipe. You’ll want to stir in the cheese during the last five minutes of cooking the polenta. at the food items currently popular. Your down-home cooking style is great!